The designs of the third series of Malaysian coins draw its inspiration from distinctive elements that define Malaysian culture and heritage. They feature motifs from traditional crafts and flora and fauna. 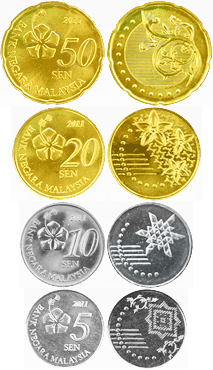 The coins reflect the diversity and richness of Malaysia's national identity. 20 sen "Bunga Melur": the jasmine flower is culturally significant among the three major races in Malaysia. Its aromatic scent makes it an important part of traditional ceremonies like weddings and prayers. It is also a popular motif in traditional arts and crafts like embroidery and silverwork. 10 sen "Orang Asli": the aboriginal tribes of Malaysia are talented in weaving indigenous leaves and plants into decorative items such as headbands, sashes and skirts for traditional rituals and ceremonies. Each tribe have their own weave pattern that is often inspired by their belief system and surrounding environment. On the new 10 sen coin, this heritage is represented by the unique weave pattern of the Mah Meri tribe in Peninsular Malaysia. 5 sen "Destar Siga": this cloth is an indigenous form of fabric weaving that originates from the Kadazan Dusun tribe in Sabah. Used as a headdress during traditional ceremonies, it is woven mainly from yarns of black thread and accented by multi-coloured threads into various geometric patterns and flora and fauna inspired motifs. These look strikingly similar to the euro coin designs.